Industrial forklifts can be used for lifting materials that are otherwise impossible with smaller warehouse versions. The industrial forklift is used for a variety of tasks. They are one of the most common types of machinery we see on job sites. In fact, you have probably seen them in big-box stores, on construction sites, and even on farms to help lift hay bales. However, not everyone should use an industrial forklift. Adequate training and certification should be obtained before a worker operates the forklift. The industrial forklift is very versatile and comes with an array of attachments as well. Discover the many uses of the forklift, the history, the present, and the future of it as patents are created and manufactured. There are many jobs that the industrial forklift works best for due to its versatility. It transports heavy materials in warehouses, ports, and railways. It is used to unload and load goods in many different types of work sites, and it is especially well-suited for work on rough terrain. 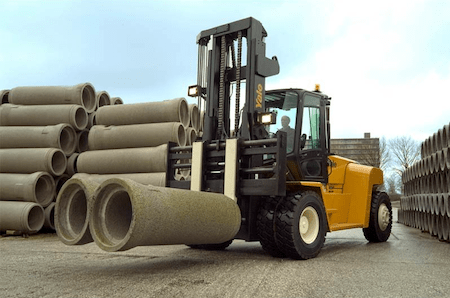 Since the forklift also has rear steering, it is a great piece of equipment to have handy for transporting, stacking, loading, and unloading heavy materials in many different scenarios. The operator has the opportunity to drive in reverse rather than have to take sharp, tight turns which are common in a warehouse setting. One of the primary functions of a forklift is to transport heavy materials. The forklift can be used in carrying product pallets in warehouses. It can also be used on railways, ports, and dry docks. Most often it is used to transport materials through construction sites. While the industrial forklift is excellent for transportation purposes, it is also used to load and unload goods in warehouses. In fact, in the mid-1900s warehouses changed their composition to have narrower aisles and higher-stacking shelves. It was done this way so that forklifts could pass through narrow passageways more easily. 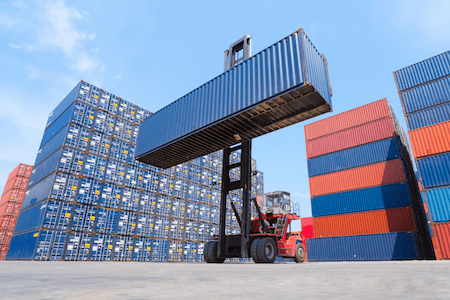 Just as the forklift is used to load, unload, and transport goods and materials, it is also used to stack pallets and shelving in warehouses. Since the remodeling of warehouses in the mid 20th century, forklifts have been the main type of equipment used for stacking products and pallets. 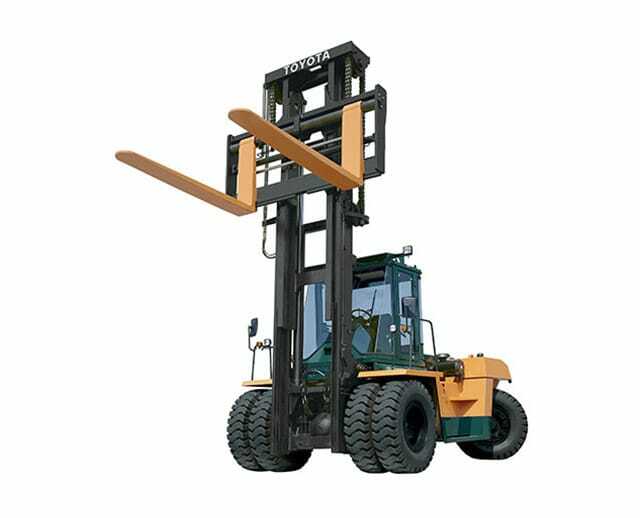 The hydraulics in forklifts are controlled with levers which manipulate the hydraulic valves. Another option is the hydraulic valves being controlled by electrical actuators. The electric option allows for a more ergonomic design. Since there are many variations of the forklift truck, load capacities also vary. In warehouses, forklifts have a lifting capacity of up to 5 tons. Larger forklifts can handle up to 50 tons which are used to load shipping containers and other heavy materials. A forklift operator also has the ability to tilt the mast. This helps in balancing the load while maneuvering and counters the risk of the blades hitting the floor or the load slipping off the lift. Fun fact: Every year forklift operators compete in regional forklift rodeos. This is only for skilled and experienced operators. There is a total of 20 popular forklift manufacturers. The countries in which they are built include the United States, Germany, and Japan. There are three big names in the forklift world. 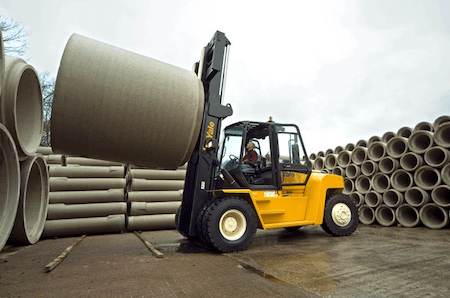 Ohio is home to two popular brands, the Hyster-Yale Material Handling company in Cleveland and Crown Equipment Corporation located in New Bremen. The third big name is Mitsubishi Caterpillar, a standard in premium heavy equipment. NACCO Industries, formerly known as the Hyster-Yale Material Handling Company, is located in Cleveland, Ohio. Hyster-Yale is a leading designer and manufacturer of electric warehousing and internal combustion engine powered industrial trucks. They are a leader in the industry with approximately 830,000 forklifts worldwide as of 2015. Even though NACCO absorbed Hyster-Yale entirely in 2012, they still produce forklifts. These lifts are most commonly used mainly for dry docks and rough-terrain settings. Caterpillar started in 1886 building the first combine harvester in Stockton, California. Since then, Caterpillar has been a renowned name in everything from personal lifts to dozers and everything in between. Caterpillar is one of the most well-known names when it comes to heavy equipment. Mitsubishi Caterpillar Forklift America is headquartered in Houston, Texas. It is located on 42 acres and produces about 25,000 forklifts every year. This four-wheel, cushion-tire forklift has been rated as one of the most operator-friendly forklifts in the country. This model is designed with heavy duty capacity in mind. With intuitive thumb-actuated lift controls and Accutouch e-hydraulic mini levers, every aspect of this lift is contoured to reduce operator fatigue and downtime. The GP360EC boasts an impressive 36,000 lbs capacity and travels at 17.3 miles per hour with a lift speed of 98.4 feet per minute. When you have a heavy job like moving heavy metals, concrete, or even pallets of produce or forest products, the GP360EC can do whatever needs to be done. The GP360EC is also compatible with several accessories like pipe clamps, steel coil rams, and paper roll clamps. The Toyota HCIC is an absolute beast. This High Capacity forklift can lift a mind-blowing 100,000 lbs at its max. It comes standard with a 5.7-litre V-8 engine and high capacity cooling system to ensure it can keep up with all the heavy lifting you can throw at it. With all that power, the HCLC also has a narrow enough frame to be an indoor mammoth. The High-Capacity IC forklift can use a number of different accessories, making it extremely versatile. Whether you're moving pipe, trees, pallets, bales of trash, metals, or concrete the HCLC can handle whatever you can throw at it. Caterpillar products are known for being built to perform to the highest standards. The DP160N is no exception. 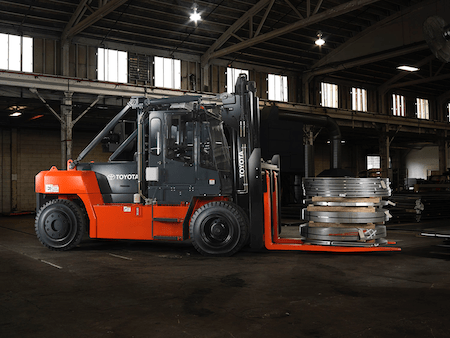 This mid-size cushion-tire lift truck provides optimum power, increased energy efficiency, and some new operating features to make your workday better. The DP160N offers a maximum weight capacity of 36,000 lbs so it can handle almost any job around the job site. The Perkins 1204E 4.4L diesel engine draws on 80 years of world-class engine design, providing more fuel efficiency than previous models. The Caterpillar DP160N also offers a full-suspension vinyl seat to take the strain off the operator's back, and Fingertip Hydraulic Controls for ergonomic operation. The hydrostatic steering allows for greater turning with less effort, and the DP160N comes with a big LCD screen for clear readouts. There's a huge selection of forklifts to choose from. Forklifts come in any number of lifting capacities and offer a variety of control patterns and safety features. The biggest things to consider when choosing the right type of lift for your job are load capacity, lifting height, maneuverability, terrain, and engine type. These specifications are where you can pick the lift that will get you the best productivity for your dollar. Know what you'll be lifting and how often. Efficiency with a forklift is directly proportional to how you use its lift power. If your load limit is rated for 4000 lbs, that is the most you can safely lift, but if you're constantly lifting the maximum weight, then you'll be using a lot of energy to do it. Pick a lift that's slightly more powerful than you need. It does no good to have a lift that can't go as high as you need. Measure your worksite and choose accordingly. Think about the places where your lift will be working. If you have narrow aisles or tight corners, then you need to select a model that can perform under these conditions. Cushion tires forklifts work perfectly on flat, stable surfaces. Not all job sites offer this, though. If you need to do outdoor lifting, then know your ground. Inspect for areas of unstable terrain or uneven ground. Rough terrain forklifts are a good solution if needed. It is important to observe safety standards in order to protect the integrity of your forklift rental. As with the operation of any heavy equipment, the industrial forklift has its own associated hazards. Without proper training or following appropriate safety protocols, accidents can happen which can result in damages, injuries, or even death. It is up to you and your workers to know about these safety hazards. Unfortunately, most accidents associated with forklifts have to do with pedestrians. Pedestrian accidents are usually caused by view obstruction, turning the wrong way, or speeding. Be sure to check all of your surroundings, and don't carry loads that exceed your line of vision. On sites where many people are walking or have narrow pathways, speeding can be extremely dangerous. Another hazard that can cause accidents is loads. An operator needs to be sure that the weight they are carrying doesn't exceed the maximum capacity of the forklift. If you're carrying hazardous materials, follow all safety guidelines provided. Be sure to stabilize all loads before driving away. Further, ensure that your line of vision is clear, and so is your surrounding. A poor work environment can cause dangerous circumstances. A poorly lit warehouse can cause visual impairments and other accidents. Using ramps can also cause forklift accidents, and an area that isn't well ventilated can lead to inhaling harmful emissions from the lift. Crossing railway tracks can also lead to unstabilized loads. Safety is always the number one concern on any job site. The easiest way to increase overall safety on the job is to make sure that all workers are properly trained according to OSHA standards. The second most important rule for increasing safety and decreasing accidents is following safety protocols and standards every day. OSHA has designated three main areas of safety protocols related to industrial forklifts. Forklift tip-overs are the number one cause of fatalities when operating a forklift, representing 25 percent of all fatalities. The leading causes of these types of accidents are the load itself, the factory environment, and the actions of the operator. Operators should always be aware of the capabilities of their lift, and never attempt to move any loads over their weight capacity. Before operating a lift, workers should inspect the area they will be working in for possible falling materials hazards, uneven or unstable terrain, and any other external hazards. Operators should also perform a pre-work inspection on the vehicle and never operate a vehicle that is damaged or has had safety gear disabled. Operators who have to work with hazardous materials like radioactive materials or combustibles need to be aware that their general workday will contain more hazards that the average worker. As such, workers need to be made aware of what they will be transporting and have all Material Safety Data Sheets (MSDS) made available as well. These sheets let a worker know about other protocols that need to be taken when working with each hazardous material. Properly maintaining your equipment is one of the simplest ways to keep your job site functioning smoothly. Breakdowns not only cause delays but can also cause accidents, so a proper pre-work inspection of equipment should always be done. Make sure all signals are functioning properly, as well as checking that the vehicle has adequate visibility through the windows. Make sure that all safety belts are in working order, and that there is no damage to the rollover cage. Never operate any vehicle where the onboard safety systems have been tampered with. Proper training is the number one thing you can do to reduce accidents and fatalities on your job site. Properly trained operators are not only safer, but they are also more cost-efficient because they are more likely to operate their equipment efficiently and will cause less wear and tear on the machine. Making sure that all of your workers are properly trained and certified for forklifts is not only a smart thing to do, but it's also the law. OSHA has training standards that are required for any person to operate a powered lift truck. If your operators are found to have not completed the training, then your job site can get shut down. The state could also take away your business license, and you could lose any security bonds you may have in place. Luckily, there are a wealth of training programs available either locally in your area, or online through various programs. There are even programs where you can train your licensed operators to be certified trainers themselves. Forkliftcertification.com offers two different training courses. The first is a standard training program via DVD's, computer software, and on-site evaluation via a licensed trainer. The second is their train-the-trainer program which allows for any of your licensed operators to become certified trainers. This way, you can do all of your own training in-house without having to pay a per-operator fee or do off-site training. Training is imperative for anyone operating powered industrial lift trucks. Not only is it the law, but in the event of an accident, there are other considerations. Insurance claims can be denied if you allow a non-certified worker to operate a lift. Bonds can be revoked as well. Also, if you are renting the agreement can be voided, and you can be assessed for any wear and tear on the equipment. Get the training needed so that you can protect your job site, yourself, and your employees. Do my workers need to be trained? Yes, BigRentz.com requires that all of your operators be certified before operating the lifts. Genie Lift Pro Training is available for any of your workers who need it. Can I drop off or pick up my equipment? No. For insurance purposes, all equipment must be transported to and from your job site on BigRentz trucks. What are my rental options for forklifts? BigRentz offers a wide range of forklifts for most needs. You can choose the right model for you, and BigRentz offers daily, weekly, and monthly rental rates. What if I rent the wrong size lift? No problem. Contact a representative, and BigRentz will bring you the correct-sized lift and pick up the improper one. Developments for forklifts as we know them today began in the mid-1800s through the mid-1900s. During World War I, many types of equipment were developed for handling different kinds of materials both in the United Kingdom and in the United States. Forklifts became a favorite for handling heavy goods which included stacking, unloading, loading, and transporting from site to site. The earliest models of the forklift were powered manually. By 1917, Clark Material Handling started production on powered lift tractors. By the late 1930s, hydraulic-powered forklifts and the first electric-powered forklift were introduced. Once the new standard pallets were added, it helped popularize the lift trucks. Due to warehouses needing forklifts with more maneuverability and with a higher reach, new models that filled this need were developed. Between the 1950s and 1960s, concerns for operator safety increased due to higher reach and greater lifting capabilities. Safety features were implemented such as the overhead guard or operator cage and backrests. By the end of 1980, a new more ergonomic design was introduced which reduced injuries and helped increase productivity. 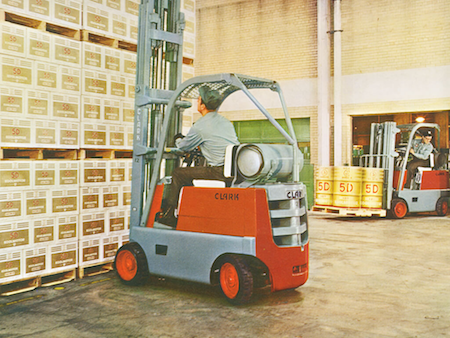 The end of the 20th century saw fuel cell technology, and AC power forklift models were also incorporated. As safety became the primary concern for all operators, many patents were filed for features that would help protect the operator. 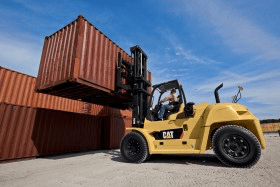 With industrial forklifts being a widely used type of equipment, it was essential to revamp the models for their safety, handling, and lifting features. Several patents for the industrial forklift were added to the design. The safety bar protects the operator from injury should there be an accidental impact. The safety bar is also flexible, reminiscent of a seat belt. It is placed directly in front of the operator extending from one end of the cage to the other. The reverse drive handle allows the operator to drive the lift in reverse without needing to control the vehicle with their foot. This allows the operator to have full control and view of their surroundings. The driver-assist device is placed on the back of the forklift truck. The device gives off more light and provides a field of vision for when the truck is on the road. It is most beneficial at night and when the forklift driver is going around a curve. The driver-assist device was created to avoid night work accidents. The forklift is one of the oldest and most widely used pieces of machinery on any job site. Warehouses use them for moving and stacking pallets, farms use them for bailing hay, and construction sites use them for moving materials and loading and unloading goods. Modern improvements on forklifts are moving toward keeping the operators safe. These include counterbalance systems to prevent tip-overs, presence detection to avoid collisions and runovers, and suspensions on seats and wheels to prevent wear and tear on the operators' bodies. Advancements are often made, as an upgrade. Today's modern industrial forklifts are more versatile than ever. With all the new features and models available, you're sure to find the perfect lift for whatever job you need to do. Contact BigRentz at (888) 325-5172 today and speak with one of their friendly professionals to get started.